I saw a programme on TV where they were making Beetroot cake and was instantly intrigued. I like vegetables but beetroot is potentially one of my least favourite, far too earthy for me, however chocolate is one of my favourite things ever so I decided that a chocolate beetroot cake had the potential to be quite nice. I’m really no baking queen so went for the easiest recipe I found which was the Blitz and Bake Beetroot cake on the BBC Good Food Website. It was really easy to make, I simply put all the ingredients together in a food processor, blitzed and baked in the oven for an hour. 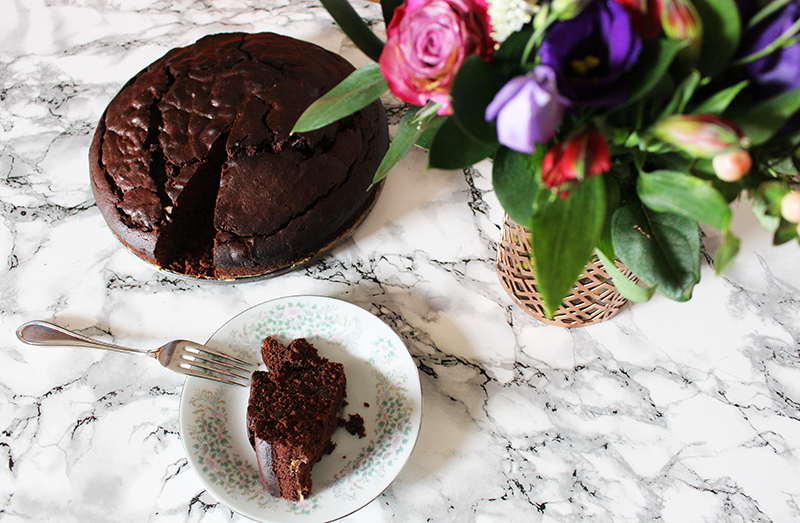 I didn’t actually have the right tin for it so it ended up a little over cooked but was still really delicious and there was no beetroot taste at all, just a great chocolate cake! I was tempted to say that it’s a healthier alternative but there is still quite a lot of sugar so it probably isn’t. Beetroot cake is also quite a nice conversation starter too since most people don’t put veggies (other than carrots) in their chocolate cake! What other unusual cakes have you had recently?